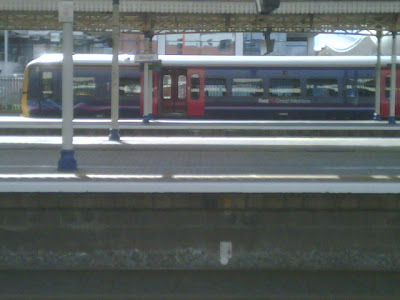 A few weeks ago I took a day trip to London leaving very early in the morning and returning late that night. This trip was part of my "reward" for taking care of the kids on my own for a month this summer, one of which had a broken arm that required surgery. I need to post about that whole ordeal sometime but it is all still a little to traumatic! Anyways, I digress....So, I headed to London to see Windsor Castle where my man Henry VIII is buried, to visit the Victoria and Albert Museum and to see Kate's wedding dress which is on display at Buckingham Palace. 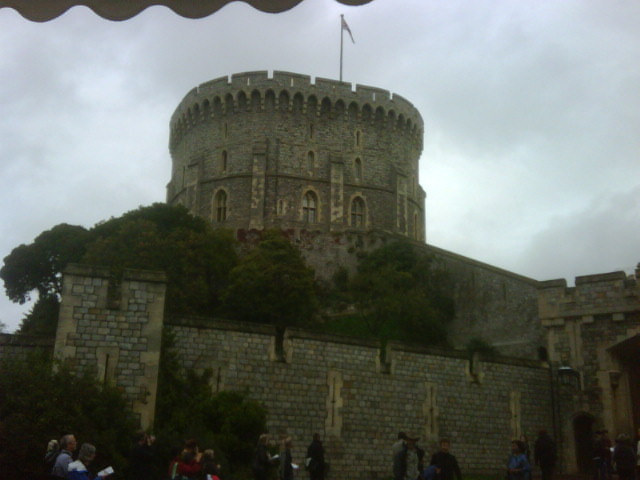 Windsor is where the queen spends her weekends when she is in London, it is a fully functioning castle and was once lived in by the King John of the Robin Hood tales although I should note that that story is not at all how it happened. A lot of the "newer" portions of the castle and surrounding walls were built from the bricks obtained from the destruction of the monestaries when Henry VIII tossed the Catholic church by the wayside to marry Anne Boleyn. But, most importantly of all it is where this man, whith whom I have an unnatural obsession with is buried. I found his tomb in the chapel of this castle. This was no easy feat as it is nothing more than a black marble square in the floor. Apparently the actual coffin is under the floor in the crypt and yes, you can access it but only the high priest ever goes down there. And no, they never let anyone else down there no matter how much it would mean to them. And yes, when they say the gate to the crypt is locked, it really is. Even if you push on it really hard when no one is looking. 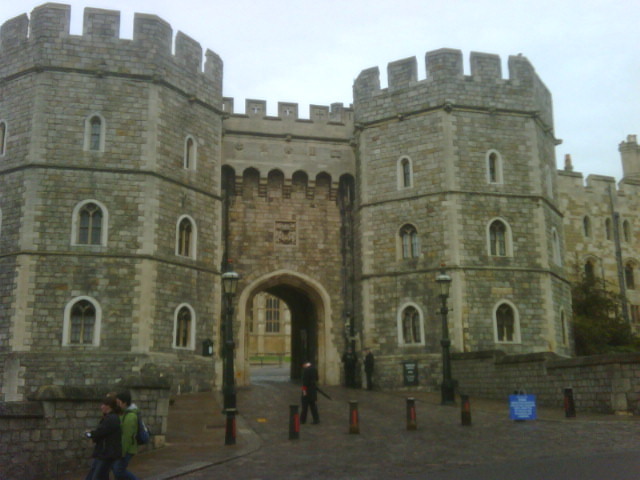 You could totally climb the gate though if no one was around to care...I wonder what the least busiest day is at Windsor? Things to ponder, things to ponder. 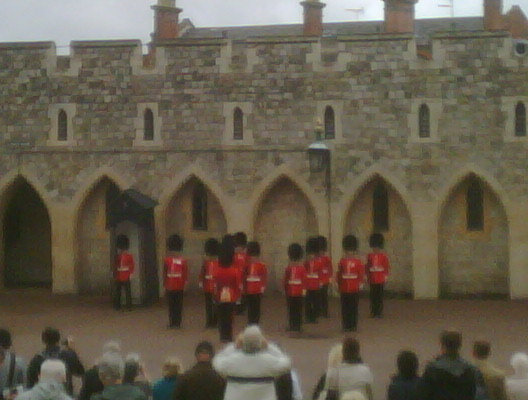 While at Windsor I got to see the changing of the guard. I have not seen this at Buckingham where I think most people watch but it was kind of cool anyways. I do not know how they expect to protect anyone from anything when they can barely see out of those big, furry hats. From Windsor it was on to central London. This was a bit trickier than coming from the airport but I got there and have included a picture from one of my train changes 'cause I was pretty proud that I did not have to resort to taking a cab. I went straight to the V&A museum and I don't know if my early morning was catching up to me but I found it....boring. It seemed disorganized and sprawling and there was way to much sculpture. On the plus side entry is free so at least I wasn't out any money. 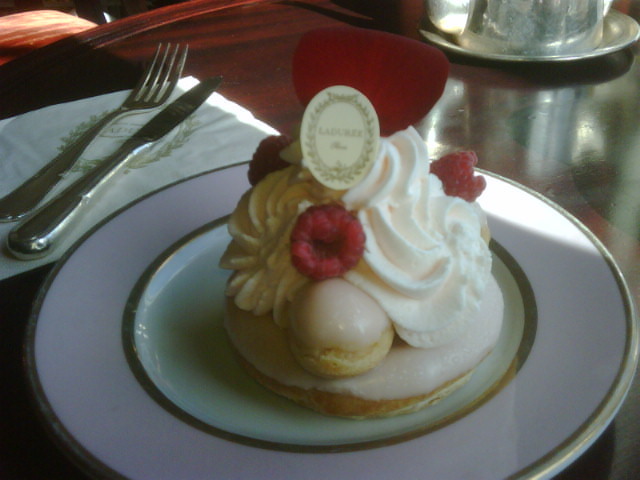 From the V&A I popped into Harrods to have some lunch. My dessert was the most amazing concoction I have ever seen and was worthy of a picture before I gobbled it up! I then jogged over to Buckingham to see the dress. I have already toured the palace and have seen the crown jewels and just wanted to see the dress. NOT because I was in a hurry or cutting it close on time(ok, info lady, I was a little bit, I stress the word little) but mostly because once was just enough! My jealousy of Kate and the fact that she will one day be queen was not helped by seeing her beautiful and very tiny waisted dress on display. I do have to laugh though when I think of the her showing the queen her wedding dress display and the queen saying she found it "creepy". Queen El II cracks me up, she is such a pill! From Buckingham I headed back to the airport and had a nice kid free flight back to Dusseldorf. In a way I feel sorry for people who have never flown with small children, they have no horrible flight experiences of kids throwing up on them or crying the entire time to make flying by themselves so blissful. It was a great day and I will miss being able to do this when we no longer live here. Thanks to Ryan for taking the kids while I was gone! I took this photo today after I dropped James off at his preschool. This is in the forest where he goes to school and where I go walking. It is probably the most beautiful piece of land I have ever been on. It is so peaceful and quiet in there. 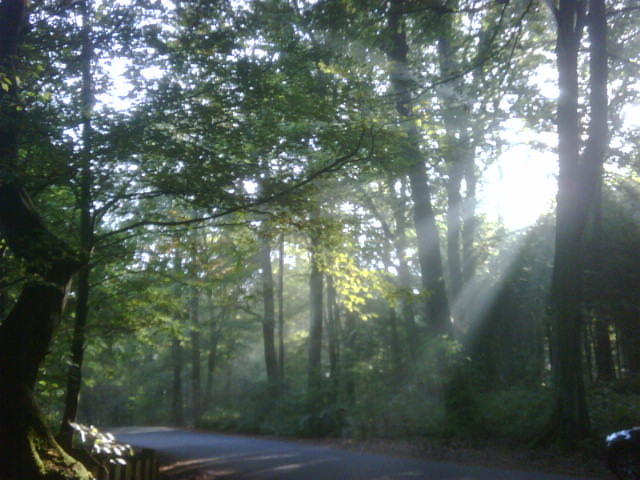 All I can hear are sounds of nature with the birds chirping and the wind through the trees. When I think of things I will miss when we go back home, this place is pretty high up on the list! As promised here are some pics from Scotland. We had such a great time on this trip! We spent the first half on the SW coast and the golf resort Turnberry and the second half in Edinburg. We flew to Scotland and then rented a car when we got there as Ryan and I both wanted to have the experience of driving on the other side of the road from the other side of the car. It was awesome and just a little bit scary! It's kinda hard to judge where you are on the road when you are on the other side of the car but I think we both did really well! Our hotel in Turnberry was beautiful and had a great view of the coast. Each night at 6:30 a man in full Scottish dress came out to the back porch and played the bagpipes for 30 minutes. Groan if you wish but I loved it, so much so that I bought a CD of bagpipe music that I made everyone listen to on the way to Edinburg. Odd though that I haven't seen that CD since....Ryan? Any comments? Suggestions as to where it might be? While at Turnberry the boys got to do a little bit of horsebackriding, except for James who was TERRIFIED of the horses. We walked along the coast where somehow Adam fell in the water and got completely soaked! I had my first fish and chips, it was delish! So much so I included a picture :) The boys did a golf clinic with Dad and no European trip would be complete without a tip to a castle. We did not hit any cathedrals this time though to the boys' immense relief! I absolutely LOVED the Scottish people. Everywhere we went they were so sweet and friendly and willing to have a chat with you. All in all it was one of my favorite trips so far and we have definite plans to head back to Turnberry some day. 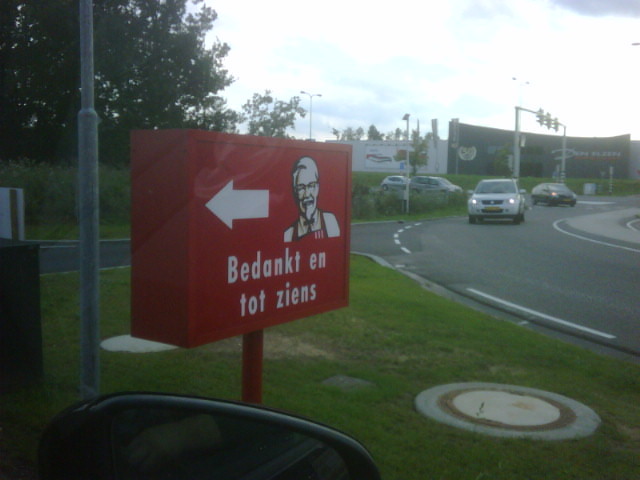 I have to say, I love the Netherlands and I love the Dutch and their crazy language. We get a few Dutch radio stations and are often crossing the border into the Netherlands to pick up groceries as they have a much larger selection of goods than can be found in Germany. I don't really know how to describe how Dutch sounds except to say that it sounds kinda like gibberish. The title of this post is pronounced: who got it and it's how you say how's it going. Some other Dutch favorites are: soap=zeep and pudding=vla. I mean come on, vla! That's not a word! Please pass the vla! I have met several Dutch people over the last two years from our travels and from friends at the boys' school and I think they are fun, friendly people. The all speak English really well partly because there is no Dutch tv. They watch tv in English with Dutch subtitles. We took a trip to Amsterdam last summer and really enjoyed it. The whole city has a canal system and we were able to purchase a family hop on hop off ticket for the canal boats to take us around the city. We toured around the city, ate some good food, avoided the "coffee shops" and the red light district....although I found it immensely amusing that there are late night tours offered through the red light district that are led by former prostitutes. Reading through the reviews of this tour on my favorite go-to website www.viator.com for figuring out what to do where when we travel was intertaining! My favorite review was short and to the point and said: very informative! Yes, I'm sure it was. This last Saturday we loaded the fam up in the VW Touran to spend the day in Roermond, NL. This little city is about 40 min from where we live. It has an excellent grocery store and a good movie theater with a large selection of movies shown in English. We took the kids to see Zookeeper (I'll save you the time and the money, you can pass on this one) picked up some tasty Dutch goods, swung through KFC and headed home. Thanks Roermond for another great day trip, dank je wel (kinda sounds like donkey vell). Ok, so it has been a really long time since I have posted anything. I guess we were just busy living for awhile! But, I have since realized that we are making some pretty incredible memories here that I don't want to forget! So, quick recap: last year was our second year here in Dusseldorf. Last school year went really well and we had some amazing travels. We went to Paris with Ryan's parents, showed my parents around Dusseldorf and went on what has been one of my favorite trips so far to Scotland! I'm hoping this blogger motivation stays with me long enough to post some pics from these trips. But the best part about last year was that somewhere around March we came to really love being here in good ol' Deutschland. We have loved the travel aspect all along but have found our living situation....difficult. So many things went into the way we felt about living here but I think one of the biggest things was just how different life is here compared to life in America and apparently I am not as good with change as I thought I was :) We have grown so much closer as a family and have learned to rely on each other living here. We have also learned to appreciate a slower and less complicated way of life. All of the little things that used to drive me crazy I have come to see in a different light and I can now see some major advantages to the way things are done here. I still say that it is hard work being a German and I will hate till the day I die my very, very small and very, very slow washing machine and dryer but, I have found so much beauty and so much to love in this place! So as we start what will most likely be our last year in Dusseldorf I hope to soak up ever little bit that Germany and Europe have to offer before we head back to Colorado. I have been a total slacker with this blog and am taking New Years Day to catch up! We recently had two birthdays in our family! James turned two on the 14th of November. James has been unlike any child I have ever known! I never see him sit still and he has an amazing ability to assess a room and zero in on all things most likely to cause damage and then find those things in a matter of seconds! There is not a stroller, car seat or highchair created that he can't find a way out of. Even when I have his car seat straps so tight I am worried I am cutting off his circulation, sure enough, a few minutes later I hear his triumphant, "Did it!" and I know he's out again! He is also unfailingly sweet and those few minutes at night when he nuzzles his face in my neck while I sing him Silent Night (his favorite song) mean the world to me! Happy Birthday James! Isaac turned seven on the 18th of December. Isaac is special to me as all oldest children are. He has had the hardest time of the three adjusting to life in Dusseldorf. The kids in his class have been moved around a lot and it shows in their behavior. Friendships have been hard for him to find but he has hung in there and his sweet, fun personality is winning out and he is becoming a much happier boy. I am always proud of him and love him lots! Happy Birthday Isaac! The Rain in Spain Turned out to be Snow! Ryan and I decided that we were not going to go home for Christmas this year. While we really miss friends and family, we really want to make the most of this experience and see all that we can see before we are sent back home. Our trip to Spain was born back in October when a good friend told me about great deals on Air Berlin. We checked it out and saw we could get the whole family to Spain for little more than a song and decided to make Spain our Christmas break destination. The only catch was you had to fly in to one city and out of another to keep it cheap so, we decided to fly into Barcelona, spend a few days there, drive down to Madrid and spend a few days there, then drive down to Seville and spend a few days there and fly out of Seville back to Dusseldorf. Ryan served his mission in Madrid so we were excited for him to take his first trip back and this way we could kind of get a tour of Spain in the bargain! So we booked the tickets! Life got busy and we kind of forgot to plan a few minor details like where to stay, setting up a rental car and hey, how far apart are these cities!? So, a few weeks before our departure we were frantically making reservations. Did you know that a lot of the hotels in Spain don't let children under the age of 18 stay? And you can't have five people in a room? We sure didn't! After a very looooong and painful process involving Ryan having to break out his rusty Spanish (it was pretty good!) we were all set...we hoped. One of the reasons we picked Spain is we thought it would be a nice warm break from cold and dreary Dusseldorf. I am pleased (insert sarcasm here) to announce that all three cities we visited had record lows with a rare snow in Madrid thrown in for fun! It was freezing! But hey, we're from Colorado, we can do cold right! Our first day in Barcelona we went to the zoo, probably not the most popular tourist spot in Barcelona but with three small kids our tourist spots are a little different from most folks! The zoo was really fun, it was so cold we were literally the only people there so we got to see everything. We were also "lucky" enough to catch feeding time for a lot of the animals, the most memorable being the feeding of rats to the snakes. My sweet little Adam found this to be a bit disturbing and exclaimed on seeing it," This is NOT what God would want!" Thus began our first discussion of the circle of life! We had fun watching a dolphin show, seeing the hippos up close and we even had our fries stolen by a peacock at lunch time! We had a great time even though we froze. Unfortunately the kids woke up the next morning with snuffly noses and coughs but we pushed on to our next stop in Barcelona, an amusement park called Tibidabo. It was Isaac's seventh birthday and we wanted to do something fun for him. After a looong journey involving a bus, the metro, the bus again and then a tram up the mountain we arrived....to find most of the rides closed due to the cold! There were a few lame kiddy rides open and we were again the only ones there so there was no waiting in line :) Our poor kids just sat perfectly still on the rides as they were so, so cold! We gave it our best effort and lasted about and hour and a half before beginning the long journey back to the hotel. It was a unanimous decision to order room service and stay in watching Disney Channel that night! The next day it was off to Madrid and we were so happy to see some sun on our last morning in Barcelona! We took a quick trip to the beach to let the kids collect shells and run away from the tide. Even though Barcelona was so cold I was really sad to leave our hotel. It was right on the beach and from the two big windows in our room you could look out over the Mediterranean forever! I could have stayed there forever but Madrid was calling and it was time to go! We discovered that it was about six hours to Madrid so not too bad, factor in kid time and we reached downtown Madrid a little after nine pm. There was crazy traffic in the city as we made our way to our hotel and at this point Adam tells me that he needs to throw up. I could not find anything for him to throw up in so I did my best to distract him until we could make it to the hotel, which we did and I will forever be grateful for not having to find a way to clean up barf out of our rental car at ten pm in Madrid! Our first day in Madrid was a Sunday so we took a day to rest and walk around a bit. On Monday we woke up to snow and sleet but we headed off to the Prado anyways...to find it closed on Mondays. There was a shop nearby that sold Lladro and other souvenirs so we decided to take a look before deciding what to do instead of the Prado. Ryan and I both wanted to see the Lladro so we took turns staying with the kids at the front of the store to keep them away from the expensive statues. As I was leaving to go take my turn to see them, Adam decided to follow me and before Ryan could grab him he tripped over James stroller right into a shelf of Lladro. I heard the crash and felt the blood drain from my head. All I could think was how many did he break and I hope they take credit cards!! Fortunately he only broke one, a 440 euro elephant, so it cost about 600 dollars. I felt just sick but at least it was just one! Not only was it expensive but it was ugly. Of all the beautiful statues in there he broke the only ugly one. The shop assistant to it to the owners to see if anything could be done but told us we would most likely have to pay for it. By some miracle, the shop owners decided it could be fixed easily and so we did not have to pay for it!! I am so glad that I am not the owner of an ugly, broken 600$ Lladro elephant! After that adventure we decided to swap Monday's plans to tour the Prado with Tuesday's plans. So we headed off in the opposite direction to the Royal Palace. Ryan had always wanted to tour it on his mission but couldn't afford the admission so he was excited to see it. After a very long and very wet (our shoes were all squishy wet) we made it to the Royal Palace just in time for the doors to close for a private ceremony. Not to be defeated we trudged on another block to a large cathedral to discover they had just closed fifteen minutes ago!!! The day wasn't all bad though because we got to eat at Hard Rock Cafe that night which was just awesome because we miss American food like crazy!! They even had ice in their drinks! On the walk back to the hotel from the restaurant Isaac started coughing really hard which led to (moms you already know) yes, throw-up all over his coat and scarf and the sidewalk! I have never washed barf out of a coat and scarf in a hotel sink before and can't say I want to again. Despite my best efforts his coat still had a bit of a smell to it so poor Isaac got a liberal dose of dad's cologne each morning after that! Tuesday we finally got to tour the Prado before heading off to Seville. I really wanted to see the Rembrandt's but, of course, they were closed for maintenance and repair :) Maybe next time! We were also sad to leave our hotel in Madrid as it too was beautiful. Despite the challenges we experienced there we really loved Madrid, it is a beautiful city with really friendly and helpful people. They we so kind, especially to the kids. It was also great to walk up and down the same streets that Ryan tracted so long ago :) (ok, not that long ago!). So it was off to Seville and the hope of better weather. It was another six hours to Seville not counting the crazy hour and a half we spent trying to navigate Seville narrow, narrow streets with our navigation on the fritz. Mom and Dad were not the best of friends by the time we arrived at our hotel at about midnight. It didn't help that this hotel was clearly not what it had been advertised as! It was awful. I don't think the bathroom had ever been cleaned, the beds were pretty iffy and they had given our requested baby cot to someone else. It was not a restful night. Grumpiness reigned the next morning as we searched for a new hotel. Strawberries and Cream shakes from Starbucks did help all our moods though and gave us a chance to enjoy the amazing architecture in Seville. We also took a trip down to the river ( I am ashamed to say I don't know which one!) and the kids had a great time throwing rocks in the water. It never ceases to amaze me how this one simple activity always thrills them! We were lucky to find better lodgings for the night and all rested peacefully! We headed home the next day which was Christmas Eve and I was so happy to see snow when we got there. Not the slushy nastiness of Madrid but crisp, crunchy snow that I have been surprised to discover I really miss! We learned a lot from our trip and despite the setbacks are thankful we got to see another part of the world and learn more about that place and its people. I was proud of our family for keeping our spirits up (most of the time!) and we made some really good memories. I love my boys and my husband and really look forward to our next adventure! Next time better planning and warmer weather!! Ryan and I met in college and have been married for nine years. We have three children: Isaac, Adam and James. We are currently living in Germany while Ryan is on a work assignment.